There was a little candy store a door or two down from the barber shop where I’d go to get my hair cut. They carried a small selection of comic books–not many, as I recall, and also not that current. It was there after one such head-shearing that I purchased this issue of BRAVE AND THE BOLD, despite the fact that I recognized by this point that somehow, the stories appearing in this series were somehow “wrong.” I may have been attracted to the “4 Famous Co-Stars” tag, or it could be that I remembered enjoying the previous Batman/Atom team-up that I had read. The splash page dispenses with any notion of this being a story with 4 co-stars, famous or otherwise. It spells out directly that this issue will concern Batman teaming up with both Green Arrow and the Atom. It’s the second half of a two-parter, so it begins with events already underway. This issue came out at the point where artist Jim Aparo was really at his apex as an illustrator. While I knew that B&B didn’t quite operate by the established rules of super hero comics, and that made it odd to my sensibilities, it always looked great, and this issue was no exception. Author Bob Haney has enough story going on that he takes out the first two pages to recap where things stand. The whole story is a riff on the Maltese Falcon. In this case, it’s Oliver Queen, Green Arrow, who has inherited the Emperor Eagle, a huge iron statue that was crafted for Alexander the Great and all of whose owners have met an untimely end. Bringing the Eagle back to America, Queen looks poised to join them as his plane is hijacked by the Joker and Two-Face, here working on behalf of general Khan of the nation of Pathanistan, who claim the Eagle for their own. 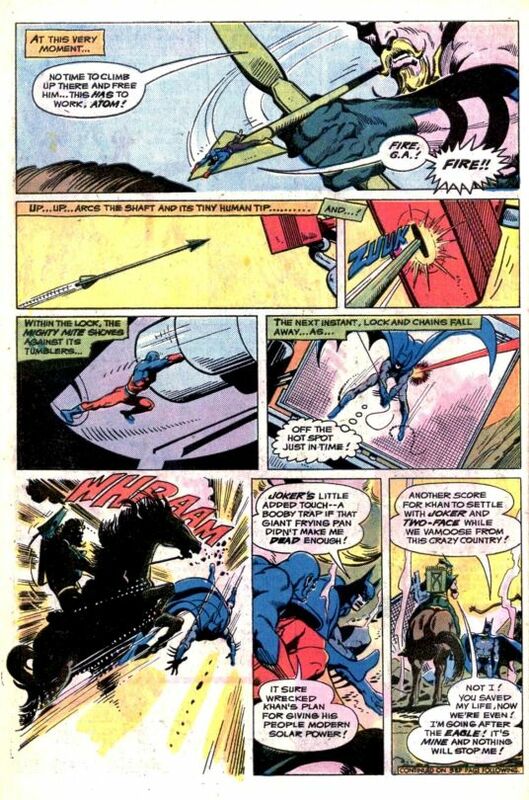 Queen is sentenced to death, but Batman and the Atom arrive in time to rescue him. 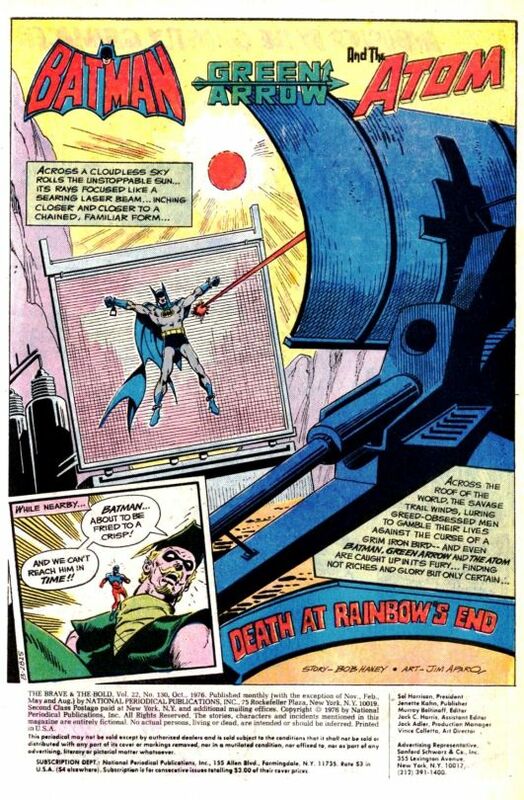 In the aftermath, though, Two-Face and the Joker take off with the Eagle, leaving Batman in a death-trap, tied to a huge solar panel. Green Arrow and the Atom combine their skills to rescue Batman, and the Caped Crusader is thereafter ready to journey back to Gotham with his two fellow heroes and leave the bird and the villains to the mercy of the desert. But green Arrow is obsessed–the Emperor Eagle is his property and he means to have it at any cost. 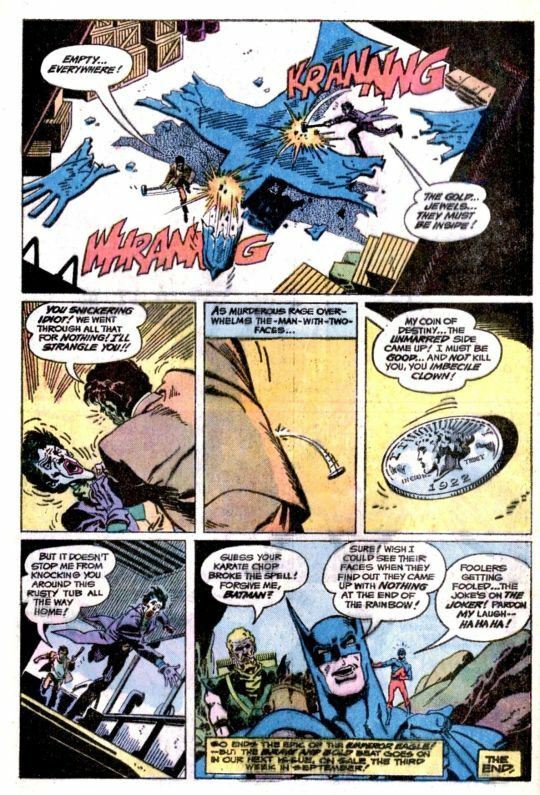 Reluctantly, Batman and the Atom accompany him on his crusade–and batman pays the price when he is caught in and seemingly buried by an avalanche. Still on the trail, GA and the Atom are caught by the descendants of the Pathanians who originally crafted the Eagle for Alexander. 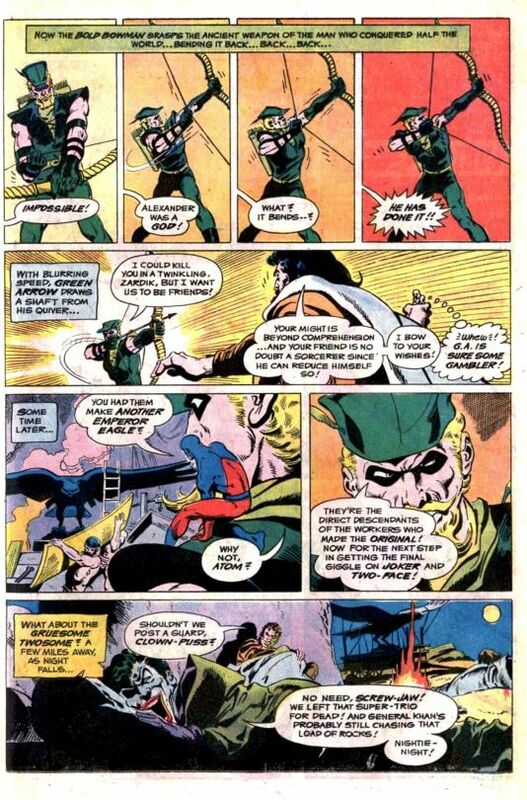 Green Arrow proves his worthiness to them, however, by using a bow that had been left by the conqueror. And he’s got a plan. He has the Pathanians create a duplicate Emperor Eagle, which they are able to do in about fifteen minutes by the look of things, and then the whole caravan sneaks into the Joker and Two-Face’s camp and switch it for the genuine article while the two villains slumber–all this despite the fact that the bird is the size of a house and requires a team of horses to move. But hey, comics! So the bad guys have the decoy statue and the good guys are home free, right? Wrong! 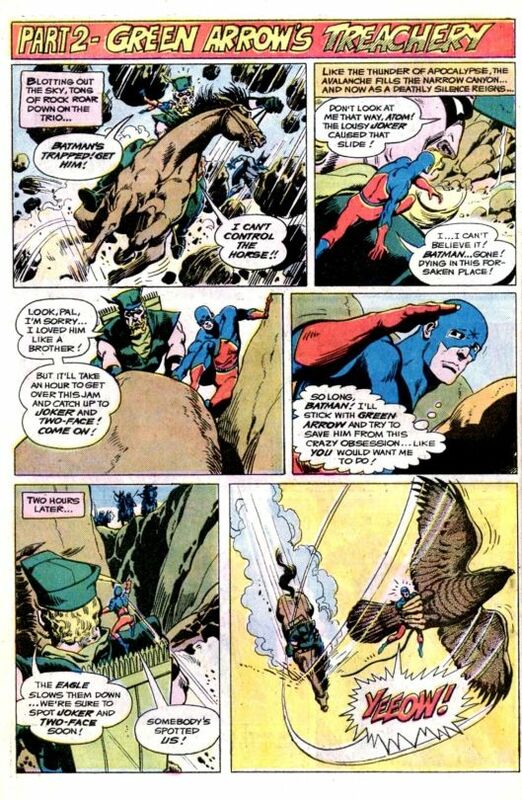 Consumed by greed, Green Arrow deliberately cuts the rope bridge over which the Eagle is being hauled, sending it, himself and the Atom plummeting into a ravine. The Pathanians think they’ve all been killed–which means that Green Arrow can now complete his mission to sneak the bird back to the U.S. And the Atom has figured out why. See, the Eagle doesn’t’ weigh enough to be solid iron as has been thought. It’s actually hollow, and filled with the gold and precious stones that made up the treasury of the Pathanians, who were trying to hide it from Alexander. Green Arrow doesn’t give a damn, though–it’s his ticket back to Oliver Queen’s wealth and he’s not sharing it with anybody. 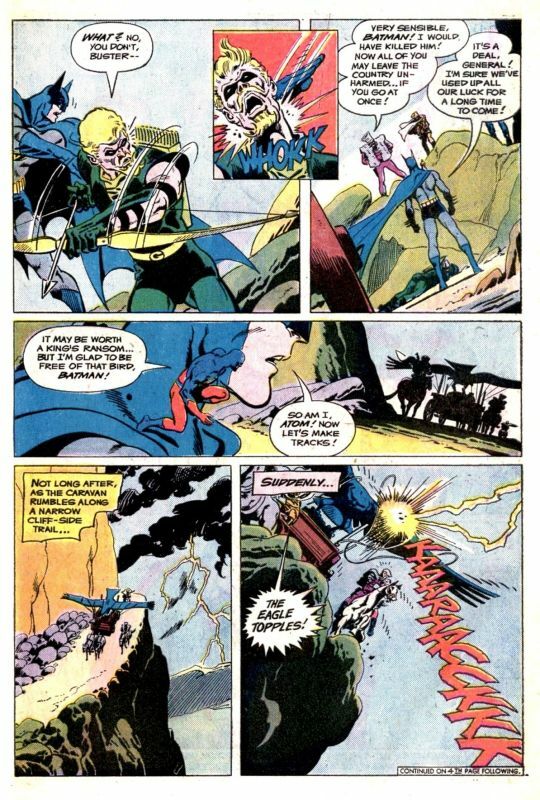 As the Atom flips out on the Emerald Archer, Batman casually saunters into frame, revealing that he survived the avalanche by falling into a convenient secret room, one that also revealed the secret of the Eagle. But then, General Khan and his troops also appear, ready to reclaim the statue for their country. 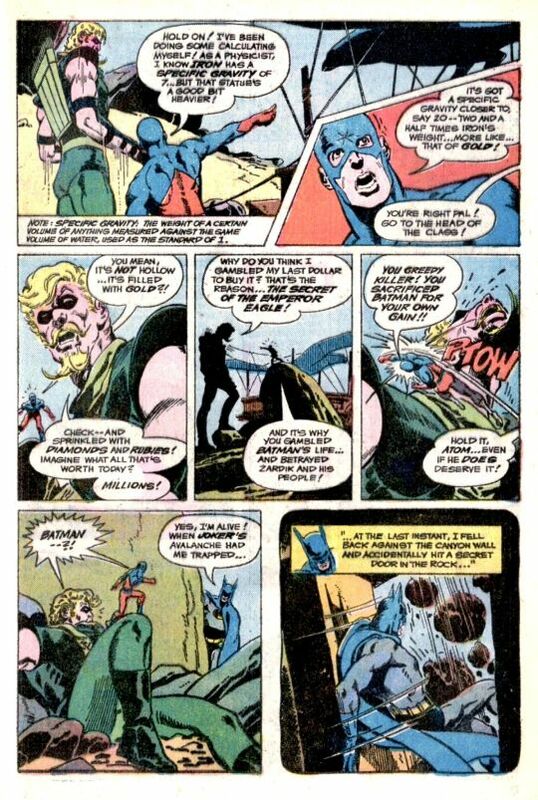 Green Arrow is ready to fight the army for the bird, but a well-placed hand-chop from Batman settles his hash. And good thing, too, as when the General begins to transport the Eagle back home, a random bolt of lightning sends it and Khan and his army toppling to their deaths in a canyon. Meanwhile, the Joker and Two-Face have begun to break up their decoy Eagle, to discover that it is completely empty. An enraged Two-Face is ready to kill the Joker for having been misled, but his coin falls from his pocket, landing clean-side up, and thus sparing the Clown Prince’s life. Meanwhile, in the most abbreviated one-panel wrap-up of all time, Batman, Green Arrow and the Atom are all smiles as they think of the villains discovering the substitution, casually and without consequence dismissing Green Arrow’s own list of crimes and misdeeds in this story as they begin their journey home. But that was BRAVE AND THE BOLD for you–the most outlandish stuff could happen, and none of it would have any impact on the characters outside of its pages.